Samurai were a class of skilled warriors, first found in Japan after the Taika reforms of 646 A.D. According to Szczepanski, these reforms included land redistribution and heavy new taxes, meant to support an expansive Chinese flavored empire(Szczepanski 1). The basis of Szczepanski's writting means most small farmers had to sell their land and work as tenant farmers, or farmers that work the land but do not own it. Only a few landholders amassed power and wealth, creating a feudal system similar to Europe's. This ineffective system soon crumbled after a few centuries. 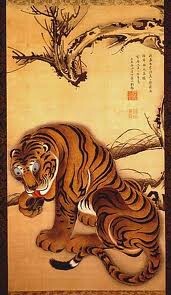 By 900 A.D, the emperors of the Heian Dynasty lost power in most of Japan. According to Szczepanski, Samurai effectively would fill the gap and hold military and political power throughout Japan by early 1100s and until the mid 1800s(Szczepanski 2). Kazuki defines Bushido as Bu (senso, bu - war), shi (actor of an action, one who does - together, warrior) and Do (michi, path or way, manner of doing). Kazuki Claims that literally speaking, Bushido was the ‘Way of the Warrior’(Kazuki 5). In other words Kazuki believes Bushido is a type of honor code that all Samurai should follow, but in actually not many were so noble as to follow each of the tenets of Bushido. There is believed to be eight key tenets that each warrior must follow. Rectitude or Justice, is one of the strongest virtues of Bushido. As Mckay would state ‘Rectitude is one’s power to decide upon a course of conduct in accordance with reason, without wavering'(Mckay 5). 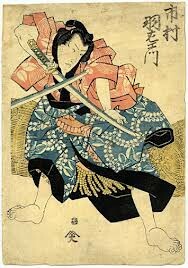 Bushido as Mckay claims, distinguishes between bravery and courage. Courage can quite simply be stated as ‘Courage is doing what is right’(Mckay 6). Benevolence or Mercy. A man granted the power to command and the power to kill is expected to demonstrate an equal ability to use benevolence and mercy. Courtesy and good manners. Found throughout Japan, and is even more so expected from those in a high position in life. Thrift or a disdain of money. While encouraged, it was a virtue that not many would follow. Honesty and Sincerity. Honor, a consciousness of personal dignity and worth, characterized the samurai.They were born and taught to value the duties of their profession. Fear of disgrace shadowed every samurai. Mckay claims that many samurai would prefer death over most forms of dishonor(Mckay 10). Loyalty to a superior was the most noticeable virtue of Bushido. Most samurai even against certain death would remain loyal to their leader rather then face the possibility of dishonor. Character and self-control. Bushido teaches that one must behave according to moral standards, and there would be no arguing over good or bad. One should know the difference. 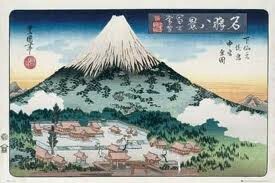 Japan from 600 A.D to around 1600 A.D was a country always at war with itself. A daimyo was a leader of a family with power in Japan. At one time there could be hundreds of clans throughout Japan. To further the daimyo's interests, the daimyo would gather samurai, who were normally in some way related to the daimyo or one of his retainers, who would fight against other clans for part of Japan's small amount of natural resources. The samurai became expert in fighting from horseback and on the ground. Early samurai emphasized fighting with the bow and arrow. They only used swords for close-in fighting. According to Mcgee, War with the Mongols in the late 13th century led to a change in the samurai's fighting style(Mcgee 9). Mcgee explains this by showing that samurai began to use their sword more and also made more use of spears and naginata after the Mongol invasions. The samurai slowly changed from fighting on horseback to fighting on foot.Samurai, as sworn warriors were one of the most well trained and loyal type of warrior of the feudal era. Samurai became the core of any daimyo's army. Peasant soldiers would flee at the slightest possibility of defeat, and would not maintain order against greater numbers. Samurai as loyal or even related warriors to their daimyo on the other hand, would almost always fight to the last and never break their ranks. A samurai is easily recognizable due to his distinctive armor and helmet. Japanese armor was constructed of leather and small iron plates. As claimed by Holy Mountain Trading Company, Lacquer is then applied to the leather to strengthen and to make it waterproof (Holy Mountain Trading Company 58). These plates are fastened together with cords of leather with each plate just overlapping the other. Cuirass or domaru armor as Holy Mountain Trading Company states, can be found around 1000 to 1100 as lightweight protection for the lower classes of foot soldiers(Holy Mountain Trading Company 58). Samurai, by the 1500-1600s would develop a heavier type of armor including more overall protection. Higher-ranking samurai or daimyos would add clan symbols and other decorative ornament to their helmets and armor so they would be noticed on the battlefield for their deeds. 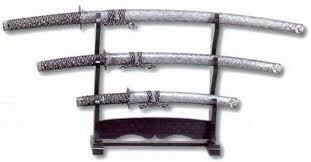 The samurai's most distinctive weapon was the katana. The art in making a katana lies in the folding of the metal. Acording to Holy Mountain Trading Company The Katana would be folded thousands of times and could require over a month to be formed(Holy Mountain Trading Company 54). This blade if wielded by an expert swordsman could cut a man in half with one swing. Samurai also used a shorter blade normally used for Seppuku or suicide to avoid dishonor and fighting indoors. Samurai originally were expert archers and could use spears or naginata. A naginata was a long pole with a large curved blade at the end of the rod. This allowed for a stabbing or slashing motion unlike the typical spear. By 1543, the Portuguese would arrive in Japan and bring the innovation of firearms. Firearms would make it possible for daimyo to arm large peasant armies with deadly weapons without the training samurai needed. 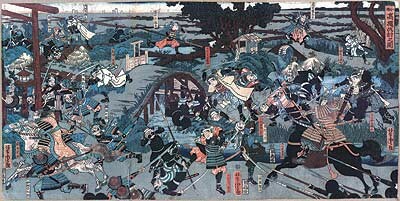 In 1575 at the battle of Nagashino, Oda Nobugawa deployed 3000 gunners against the feared Takada mounted samurai, renowned for their fierce and unstoppable cavalry charges. 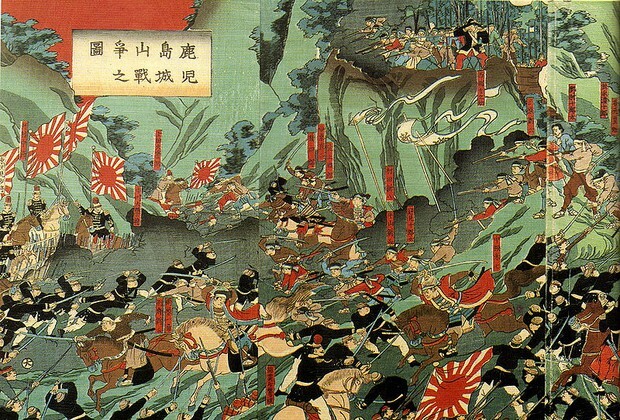 According to Holy Mountain Trading Company, Nobugawa's 3000 gunners would shatter the Takada samurai in a complete victory(Holy Mountain Trading Company 34). This would lead to samurai adopting fire arms into warfare. Without having to be in close range to defeat an enemy, as claimed by Holy Mountain Trading Company, samurai would start becoming obsolete in the world of guns (Holy Mountain Trading Company 34). The Meiji system included such democratic reforms as term limits for public office and popular balloting. With public support, the Meiji Emperor did away with the samurai, reduced the power of the daimyo, and moved the capital from Kyoto to Tokyo. In her article History of the Samurai Szczepanski suggests that The new Japanese government created a regular army in 1873 and brought in many now ex samurai as military officers, yet in 1877, many angered ex-samurai attempted a revolt against the Meiji in the Satsuma Rebellion(Szczepanski 32). Szczepanski then goes on to say that the rebel samurai lost at the Battle of Shiroyama ending the rebellion and finally ending all chance of the restoration of Samurai. 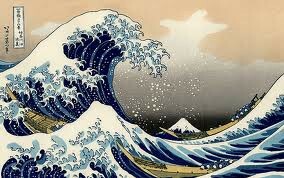 Samurai's creation started a chain reaction of events. What did they do to influence Japan so strongly? As Kazuki wrote once, 'The way of samurai is found in death'(Kazuki 4). Samurai were renowned for their great acts of courage and almost utter rejection of fear. Samurai would also choose to die rather then to dishonor their self or their clan. The era of the samurai according to Kazuki, brought the creation of castle-towns that flourished, contributions to art, poetry, religion, and philosophy, as well as war-arts, but samurai also were to blame for the Sengoku Jidai or "The Warring States Era"(Kazuki 1). During this over 100 year period, all of Japan was involved in a brutal civil war between many of the great clans of Japan. Acording to Kazuki, Japan would then develop Sakoku or the "Closed/Chained country", because of Sakoku Japan would be held back for almost 200 years by closing off all ports to foreign countries until the mid 1800s(Kazuki 11). In other words as Kazuki says, Japan would not be influenced by any outside sources until the United States arrived with warships on the Japanese coast looking for trade. With the end of the samurai one would think they would just be found in the history books, but in today's age almost everyone knows or has at least heard of a samurai before. Samurai are a very popularized group of warriors, and are found in many different video games because of their extreme sense of honor and great deeds. Samurai are also found in a form of cartoon called anime. The anime center of the world is Japan, so it is easy to imagine that samurai would find some place among the many cartoon series. As technology advances, so to does the availability of knowledge. This case is the same for samurai. Samurai will continue to be a popular focus point for a proud and fearless warrior, and will no doubt be involved in the future to come. "Samurai Cultured Warriors of Japan." Http://www.holymtn.com. Holy Mountain Trading Company, 2012. Web. 5 Nov. 2012. <http://www.holymtn.com/Japan/Samurai.htm>. Kazuki, Inoue. "The Hidden Relevance of Japanese Historical Influences." The Hidden Relevance of Japanese Historical Influences. The Samurai Archives, n.d. Web. 17 Oct. 2012. <http://www.samurai-archives.com/hrj.html>. Mcgee, Mark. "Brief History of the Samurai." Brief History of Samurai. Mark Mcgee, n.d. Web. 17 Oct. 2012. <http://www-personal.umich.edu/~malokofs/SCA/Persona/History/samurai.html>. MCKAY, BRETT & KATE. "The Bushido Code: The Eight Virtues of the Samurai." The Art of Manliness. The Art of Manliness, 2010. Web. 17 Oct. 2012. <http://artofmanliness.com/2008/09/14/the-bushido-code-the-eight-virtues-of-the-samurai/>. Szczepanski, Kallie. "History of The Samurai." About.com Asian History. About.com, 2012. Web. 17 Oct. 2012. N.d. Photograph. Emptyeasel.com. Google.com/images. Web. 31 Oct. 2012. <http://www.google.com/imgres?q=Japanese+art&num=10&hl=en&biw=1366&bih=667&tbm=isch&tbnid=TOH4tArKydR2SM:&imgrefurl=http://emptyeasel.com/2008/04/24/a-brief-history-of-japanese-art-prints-also-known-as-ukiyo-e/&docid=GTFRlorz_0M8FM&imgurl=http://emptyeasel.com/wp-content/uploads/2008/04/Ukiyo-e.jpg&w=500&h=345&ei=aFmRULrcJ4nE2wXf1oCoDw&zoom=1&iact=hc&vpx=372&vpy=188&dur=90&hovh=186&hovw=270&tx=143&ty=57&sig=102302451469101696356&page=1&tbnh=131&tbnw=199&start=0&ndsp=22&ved=1t:429,i:140>. N.d. Photograph. Samurai-Sword-Fight.jpg. Www.Google.com. Web. 5 Nov. 2012. <http://www.google.com/imgres?q=Japanese+Samurai+art&num=10&hl=en&biw=1777&bih=861&tbm=isch&tbnid=zvMPbwtTLE_ngM:&imgrefurl=http://www.arts-wallpapers.com/japanese-arts/Samurai-Art-Gallery/imagepages/image51.htm&docid=GTGmN-7jpiP2xM&imgurl=http://www.arts-wallpapers.com/japanese-arts/Samurai-Art-Gallery/images/Samurai-Sword-Fight.jpg&w=355&h=504&ei=JniYUJDxLIPg8ASVqYCoAw&zoom=1&iact=rc&dur=2&sig=108498166101525847996&page=1&tbnh=137&tbnw=102&start=0&ndsp=12&ved=1t:429,r:3,s:0,i:133&tx=605&ty=327>. N.d. Photograph. Gardenofpraise.com. Www.Google.com. Web. 5 Nov. 2012. <http://www.google.com/imgres?q=Famous+Japanese+art&hl=en&biw=1777&bih=861&tbm=isch&tbnid=2rqbsxf1_26okM:&imgrefurl=http://www.gardenofpraise.com/art14.htm&docid=Q5VZagNH0L_IBM&imgurl=http://www.gardenofpraise.com/images/ito.jpg&w=315&h=544&ei=GXmYUIKPBZG89QS2l4HQBA&zoom=1&iact=rc&dur=530&sig=108498166101525847996&page=1&tbnh=132&tbnw=81&start=0&ndsp=33&ved=1t:429,r:7,s:20,i:205&tx=34&ty=82>. N.d. Photograph. Michaellostintranslation.blogspot.com. Www.Google.com, 28 Aug. 2010. Web. 5 Nov. 2012. <http://www.google.com/imgres?q=Japanese+Mountain+art&hl=en&biw=1777&bih=861&tbm=isch&tbnid=niVtfzzXy0cFyM:&imgrefurl=http://michaellostintranslation.blogspot.com/2010_08_01_archive.html&docid=mxZQQckcugu5QM&imgurl=http://4.bp.blogspot.com/_FuGaP4T03Uo/TGov47EYviI/AAAAAAAAA00/wOztf97qoj8/s1600/Mount_Fuji-poster-l.jpg&w=480&h=321&ei=wnmYUPPzFpOu8ASRoIHYBQ&zoom=1&iact=hc&vpx=1459&vpy=567&dur=8&hovh=183&hovw=275&tx=155&ty=125&sig=108498166101525847996&page=1&tbnh=141&tbnw=221&start=0&ndsp=34&ved=1t:429,r:13,s:20,i:197>. N.d. Photograph. En.wikipedia.org. Www.Google.com. Web. 5 Nov. 2012. <http://www.google.com/imgres?q=Samurai+battle+art&hl=en&biw=1777&bih=861&tbm=isch&tbnid=rRjEEUS6XyBzkM:&imgrefurl=http://en.wikipedia.org/wiki/File:ShiroyamaBattle.jpg&docid=zh3xAy-7nuSPQM&imgurl=http://upload.wikimedia.org/wikipedia/commons/1/17/ShiroyamaBattle.jpg&w=1425&h=965&ei=gnqYUNfVG4qk8gTZj4CwDg&zoom=1&iact=rc&dur=424&sig=108498166101525847996&page=1&tbnh=128&tbnw=192&start=0&ndsp=46&ved=1t:429,r:15,s:20,i:176&tx=66&ty=62>. N.d. Photograph. Swordsknivesanddaggers.com. Www.Google.com, 2012. Web. 5 Nov. 2012. <http://www.google.com/imgres?q=Samurai+sword+set&hl=en&biw=1777&bih=861&tbm=isch&tbnid=ft2rAdmcStVHlM:&imgrefurl=http://www.swordsknivesanddaggers.com/decorative-samurai-sword-set-silver-and-grey-813.html&docid=jYL9K_K-xxFEBM&imgurl=http://www.swordsknivesanddaggers.com/swords/swords-decorative-samurai-sword-set-silver-and-grey-jbl-w4.jpg&w=540&h=270&ei=b3uYUKelG4j28wTYlIDQBg&zoom=1&iact=hc&vpx=958&vpy=362&dur=215&hovh=158&hovw=317&tx=169&ty=95&sig=108498166101525847996&page=3&tbnh=123&tbnw=247&start=81&ndsp=44&ved=1t:429,r:64,s:20,i:329>. N.d. Photograph. Forums.totalwar.org. Www.Google.com, 13 Aug. 2010. Web. 5 Nov. 2012. <http://www.google.com/imgres?q=Japanese+battle+art&num=10&hl=en&biw=1777&bih=861&tbm=isch&tbnid=uYqq6Wbj9lyC3M:&imgrefurl=http://forums.totalwar.org/vb/showthread.php%3F130058-The-Org-s-Wallpaper-Competition-sponsored-by-CA&docid=SqFRY9lRoUZi1M&imgurl=http://i156.photobucket.com/albums/t2/AndresTheCunning/Swords%252520in%252520the%252520Moon/800px-Battle_of_Kawanakajima.jpg&w=800&h=594&ei=G3yYUJLJCoby9gSNwYCoDw&zoom=1&iact=hc&vpx=201&vpy=507&dur=583&hovh=193&hovw=261&tx=136&ty=100&sig=108498166101525847996&page=1&tbnh=135&tbnw=202&start=0&ndsp=34&ved=1t:429,r:12,s:0,i:107>.